Aspergillus infection in the lung is known to lead to obstructive bronchopulmonary aspergillosis, mucoid impaction of the airways, tracheobronchitis, ulcerative bronchitis, pseudomembranous tracheobronchitis, invasive aspergillosis, or aspergilloma. Old tuberculosis cavities remain the most frequent underlying sites, and were recorded in up to 70% of cases. Out of various complications, massive haemoptysis is the most fearsome that necessitates an early surgical intervention. Pneumothorax is not identified as a common complication of ruptured mycetoma. of breathlessness, chest pain over the right side of the chest, moderate to high grade fever, and dry cough– all for duration of 2 days. There was no history of diabetes, hypertension, or any other significant disease/ disorder. The patient had a past history of smear positive pulmonary tuberculosis 3 years back for which he was advised antituberculosis drugs (ATT); he defaulted when advised first time but completed second regimen of ATT (2S3H3R3Z3E3 / 1H3R3Z3E3 /5H3R3E3), subsequently. After completion of treatment, he was declared cured of pulmonary tuberculosis though he continued to have a thin walled cavity. He had average built and good nutrition with apparent signs of respiratory distress. The movement of the thoracic cage was decreased over right side with signs of increase lung volume. The right side was hyperresonent all over the chest and the breath sounds were decreased. The patient underwent diagnostic work up; his serum was non-reactive for HIV-antigens (ELISA). 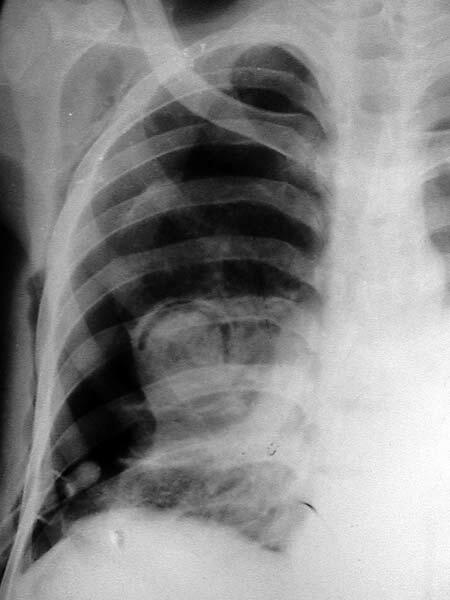 The chest roentgenograms showed right sided pneumothorax with a subpleural cavity containing a rounded opacity with the presence of air crescent sign that was suggestive of mycetoma. Immediately, intercostals drainage under water seal was placed (figure- 1), and he was given supportive treatment. 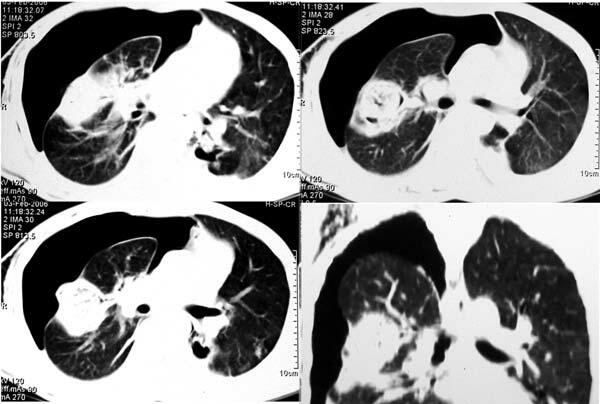 The computed tomography confirmed the diagnosis of the mycetoma and that further revealed the rupture of the subpleural fungus ball leading to pneumothorax (figure- 2). Fiberoptic bronchoscopy revealed patent central airways. The bronchial secretions and the pleural aspirate showed aspergillus fumigatus. He was also given anti-fungal treatment, itraconazole 200 mg daily, along with other supportive treatment. The patient responded to the management. He was under consideration for the surgical removal of the mycetoma; however, on fifth day he had massive haemoptysis, all of a sudden, and expired. Aspergillus is a ubiquitous fungus found in soil, water, and decaying matter. It is known to cause a wide variety of respiratory conditions including allergic bronchopulmonary aspergillosis, parenchymal invasion, and mycetoma. Mycetomas have a predisposition to occur in preexisting pulmonary cavities. Aspergillus fumigatus is the most common saprophytic species of aspergillus leading to aspergilloma. In non-immunocompromised population, mycetomas have been reported to occur in 10% to 15% of patients with cavitating lung diseases. In regions where the incidence of tuberculosis is on decline, mycetomas are increasingly identified in advanced sarcoidosis, pneumonoconioses, bullous emphysema, bronchiectasis, lung abscess, neoplasms, and pulmonary infarcts. Invasive aspergillus parenchymal infection is reported to affect 5 to 8% of solid-organ transplant recipients with a 50 –100% mortality. In HIV seropositve patients, P carinii pneumonia is a major risk factor for pulmonary aspergilloma. The patients with mycetoma are often asymptomatic. Amongst symptomatic, the most common symptoms include cough and haemoptysis. The course of disease is highly variable, and patients are usually kept under observation without therapy unless they develop haemoptysis. Massive haemoptysis necessitates surgical intervention with resection of the affected lung, or arterial embolization in the patient who is not suitable for surgery. The antifungal drugs – itraconazole, voriconazole, or amphotericin B – are used if complete surgical removal is not possible, or if the aspergillus infection has expanded beyond the aspergilloma. A combination of antifungal and antiretroviral therapy has been shown to improve the clinical outcome in HIV-infected patients with pulmonary mycetoma. Pneumothorax due to rupture of a mycetoma into the pleural space in patients who are not otherwise immunocompromised, to best of our knowledge, has not been reported in recent medical literature. Pneumothorax has been described in patients with pulmonary mycetoma undergoing intensive cytotoxic therapy for hematologic malignancies. In present case, the patient was not immunocompromised but still developed pneumothorax as a complication of the rupture of a mycetoma into the pleural space. It is significant to identify the link as both pneumothorax and haemoptysis represent the clinical expression of a more destructive course of invasive fungal diseases and require aggressive medical and/or surgical management. a series of 89 surgical cases. Ann Thorac Surg. Vol. 69, 898-903.
aspergillosis. Br J Dis Chest. Vol. 54, 335-341.
resurvey. (1970) Tubercle. Vol. 51, 227-245. (part I): overview and aspergilloma. Cleve Clin Q. Vol. 51, 615-630. 5. Lick S, Duarte A. (2002) Of Mycetomas and Men. Chest. Vol.121, 5-6. Presentation of Pulmonary Mycetoma in HIV-Infected Patients. Chest. approach to management. Chest. Vol.113, 852-853.
acute leukemia. Rev Infect Dis. Vol. 12, 611-617.
intercostal drain is also visible near the base. pneumothorax over adjacent CT sections. All pages copyright ©Priory Lodge Education Ltd 1994-2010.